Al Ahly boss Martin Lasarte has named his 21-man squad that will take part in the Reds’ next game against Misr El-Makkasa in the Egyptian Premier League. The Red Devils want to secure the win to keep the pressure on Zamalek and Pyramids, who will face each other three hours after Al Ahly’s game. 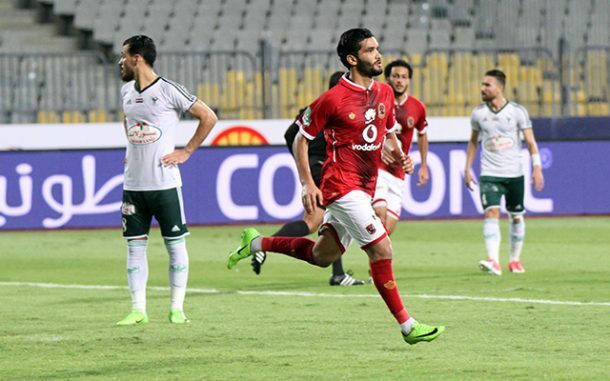 For the first time in 358 days, Saleh Gomaa has been included in Al Ahly’s squad after a loan spell at Saudi side Al Faisaly, with his last game for Al Ahly coming against El-Raja around a year ago. Saad Samir has also made the squad after recovering from injury as well as Ahmed Alaa, who missed his side’s last three games. On the other hand, Ayman Ashraf will miss the game due to suspension, and will join him on the sidelines, Saleh Mohsen, Walid Azaro, Marwan Mohsen, Walid Soliman, and Geraldo. Goalkeepers: Aly Lotfi, Sherif Ekramy, Mohamed El-Shennawy. Defenders: Saad Samir, Ahmed Alaa, Ali Maaloul, Mahmoud Wahid, Mohamed Hany, Yasser Ibrahim. Midfielders: Saleh Gomaa, Karim Nedved, Hamdi Fathi, Hussein El-Shahat, Amr El-Sulya, Islam Mohareb, Mohamed Sherif, Nasser Maher, Ramadan Sobhi, Ahmed Hamoudi, Mido Gaber.